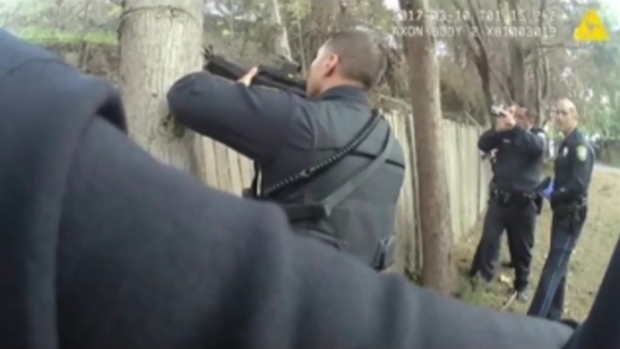 A Santa Clara police officer lawfully shot and killed a mentally ill and suicidal man during a standoff back in March, the Santa Clara County District Attorney's Office has announced. Jesus Geney-Montes, who had previously stabbed himself in the chest and told police that he had a gun and would open fire either on himself or at officers, was shot and killed on March 9 when he moved toward veteran Officer Colin Stewart, according to the District Attorney's Office. Stewart tried to first use a stun gun when Geney-Montes "rushed toward him," but it "was not effective." Stewart resorted to firing his gun. "Seeing Geney-Montes charging towards him and believing his life was in danger, Officer Stewart chose to defend himself by discharging his weapon," prosecutor Carolyn Powell wrote in a public report regarding the officer-involved shooting. "Under the facts, circumstances and applicable law in this matter, Officer Colin Stewart’s use of force was in response to an objectively reasonable belief that he was facing an immediate threat of great bodily injury or death." Officers later learned that Geney-Montes was not armed when he was shot, according to the District Attorney's Office. A Santa Clara police officer earlier this year lawfully shot and killed a mentally ill, suicidal man who charged at him during a standoff, the Santa Clara County District Attorney’s Office has determined. During the standoff, officers with guns drawn asked Geney-Montes to show his hands multiple times as he stood on an embankment behind a housing complex with his hand in his pocket. Officers could also be heard telling Geney-Montes, "You're not going to die today" and "Nobody wants to hurt you," according to body camera footage. Officers continued to try to offer help to Geney-Montes as the standoff prolonged, but he remained on the embankment and later took off running. Stewart followed and when Geney-Montes moved in his direction, the officer opened fire. Before the shooting, officers on March 9 had visited the home where Geney-Montes was four times, according to the DA's office. Geney-Montes barricaded himself in a bedroom, threatened his family members and told officers he had a gun and would shoot if law enforcement entered the room. Police determined that no crimes had been committed and decided to leave the scene each time. Geney-Montes’ stepfather, Richard Sommers, said he and his wife called the police three times that day because the 24-year-old had been acting erratically. "We were hoping either they crash the room, break a window, we don’t care. We wanted help," Sommers said. "What I saw was flat out murder. They said they Tased him. I never saw a Tasing. I never saw nothing. I saw him in the bushes getting shot. He was against a fence." It was on the fifth call that police learned that Geney-Montes had stabbed himself and fled the home, according to the DA's office. The family has filed a lawsuit against the city of Santa Clara.